Contextualizing the competitive market uptake given the ‘muddy waters’ aka hand-wringing, hedging, side-stepping or simply the ‘sensible accumulation of more data’ before taking the plunge into the controversial, in some quarters, Medicare Shared Savings Program via an ACO, will get a tad clearer as the deadline for submitting applications to CMS is fast approaching. Not a day goes by without some bit of news from either the commercial, aka private, market as well as the government sector aka Medicare and Medicaid. Whether in the form of a report from one or more Pioneer ACOs, an Advanced Payment Model ACO or from the ever growing book of Aetna, United HealthGroup or Humana et al enabled commercial market ACOs, the newswire shall we say is witnessing no shortage of buzz. San Francisco-based Dignity Health and Nashville, Tenn.-based Vanguard Health Systems have announced plans for their Arizona hospitals to form an accountable care organization and file for participation in the Medicare Shared Savings Program. Dignity Health Arizona, based in Chandler and comprised of three acute-care hospitals, and Vanguard’s Phoenix-based Abrazo Health Care, which includes five acute-care hospitals. The model would include about 700 physicians. 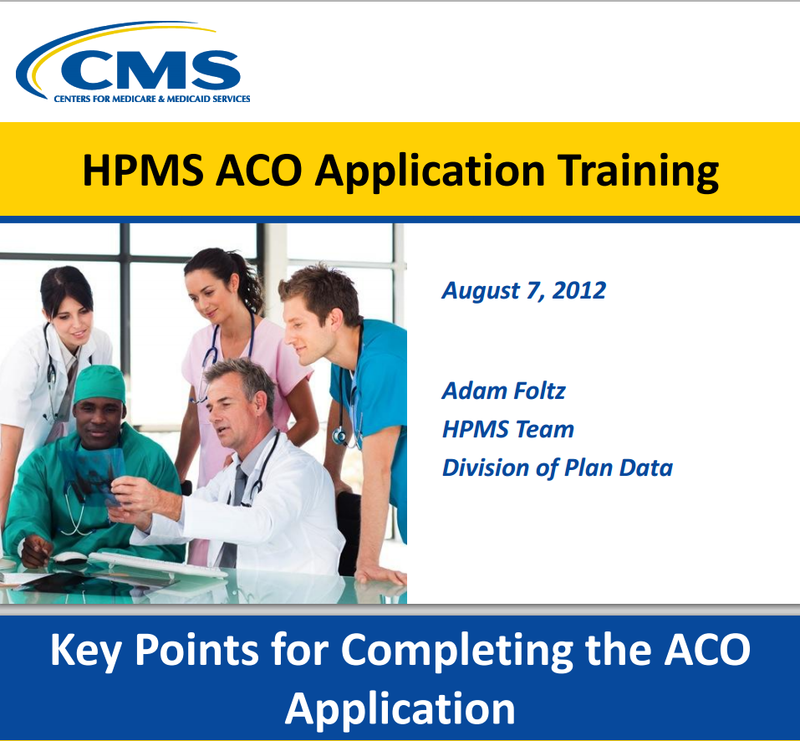 Also in the key resources department, on Tuesday, August 7th, CMS held a conference on ‘Key Points for Completing an ACO’, for the associated deck, click here. The Medicare Shared Savings Program application details can be accessed here. Also once approved by CMS, there are some first steps that you need consider, two major considerations are to digest and completely understand the terms of participation in the program, see: Medicare Shared Savings Program Accountable Care Organization Participation Agreement; and to determine your primary service areas. For background information and instructions, see: Medicare Data to Calculate Your Primary Service Areas. Bottom line, the momentum is building. Our sense is we do not need to wait to get feedback from this next round of applications submitted via the September 6th, 2012 deadline, to sense a definitive market direction. No Margin, No Mission or No Mission, No Margin for ACO Success?